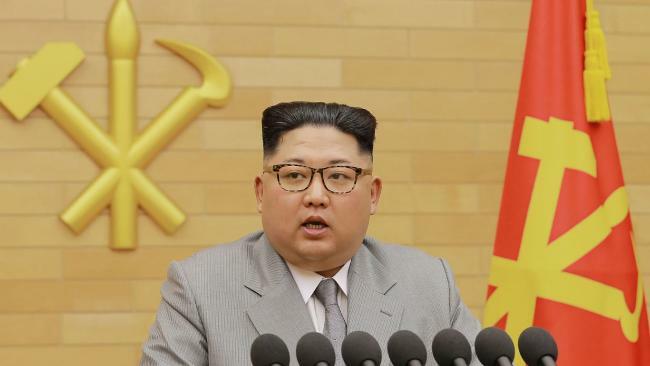 NORTH Korean leader Kim Jong-un has hosted a welcome dinner for a delegation from South Korea, the Yonhap news agency reported citing the South Korean presidency, in another sign of thawing ties on the peninsula. The South Korean envoys, led by President Moon Jae-in's top security adviser Chung Eui Yong, have been sent to Pyongyang to lay the groundwork for potential peace talks between the neighbours. The visit was also aimed at encouraging Pyongyang and Washington to talk. Both North Korea and the US have expressed a willingness to talk but the long-held American position is that the North first give up its nuclear weapons program. 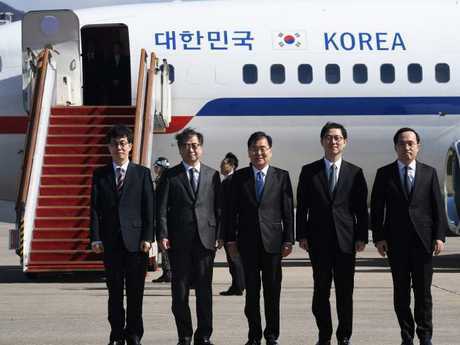 The 10-member South Korean delegation, led by National Security Office head Chung Eui-yong, was greeted by North Korean officials after landing in Pyongyang on Monday, said Kim Eui-kyeom, a spokesman for South Korea's presidential office. 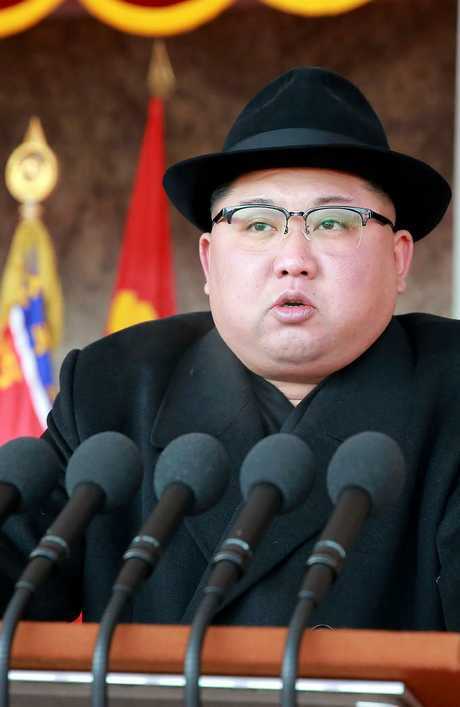 "Chairman Kim Jong-un is currently hosting a dinner for the special envoys," Yonhap quoted a spokesman for the presidential residence in Seoul, Kim Eui Kyeom, as saying. 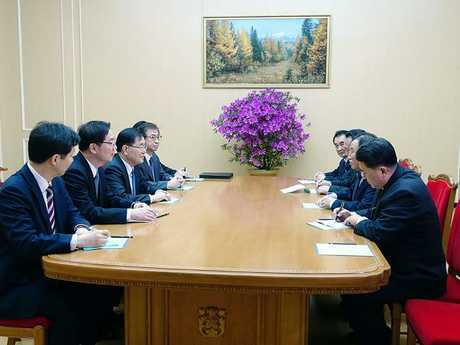 The South Korean officials are the most senior officials from the South to meet Kim Jong Un since he took power in late 2011 following the death of his father, Kim Jong-il. "We will deliver President Moon Jae-in's wish to bring about denuclearisation of the Korean peninsula and permanent peace by extending the goodwill and better inter-Korean relations created by the PyeongChang Winter Olympics," Chung said in South Korea before the delegation's departure. The visit is a response to that of Kim Yo-jong, Kim's sister, to South Korea in February during the Winter Olympics. Kim Yo-jong, the head of propaganda for the North Korean regime, attended the PyeongChang Games at Moon's invitation, and conveyed an invitation from her brother to the president to visit Pyongyang. Moon, however, has reacted cautiously. He has to make sure he's in step with his US ally, which has launched a campaign of "maximum pressure" on the North in an attempt to force it to give up its nuclear weapons. 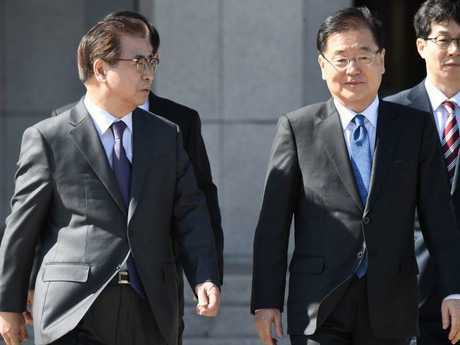 The 10-person delegation, which also includes South Korean spy chief Suh Hoon, is to remain in Pyongyang until Tuesday. Before departing for Pyongyang, delegation leader Chung said he would convey the president's determination to denuclearise the Korean Peninsula and achieve a lasting peace. The government hopes the visit will create "a positive atmosphere", Unification Ministry spokesman Baik Tae-hyun told a regular briefing. Chung and Suh are due to fly to Washington later in the week to brief US officials on their discussions in the North. Thawing relations between the Korean neighbours have prompted speculation about direct talks between Washington and Pyongyang after months of tension and exchanges of bellicose insults between US President Donald Trump and Kim Jong-un fuelled fears of war.